I have tried all kinds of different products to reduce under-eye puffiness and darkness from gels to creams to anti-dark circle eye rollers. Some of these products have been expensive and others have been drugstore. They all do a little something, but not really enough to notice a big difference. Most of us do not get enough sleep and our eyes definitely give us away! A lot of people just have puffiness right when they get up and it gradually fades. My eye problems are, unfortunately, hereditary which means no matter what I do they will always be there to some extent. After trying all sorts of different products, I resorted to a cold spoon under each eye every morning. This was time consuming, but it was effective until I found my new favorite product. It is the Sephora Instant Depuffing roll on gel. It is the same concept as the eye rollers I have used before, but it actually works! 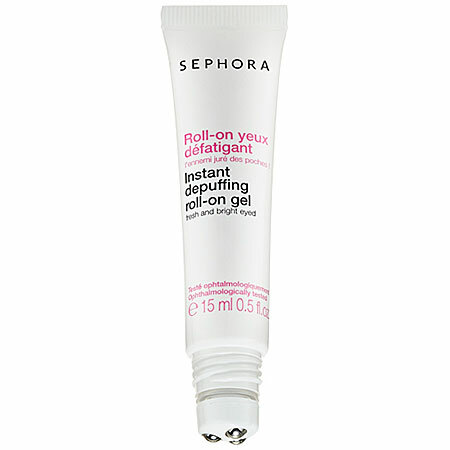 This gel contains ingredients that moisturize, brighten and reduce puffiness. I have a very sensitive eye area and many other products I have tried have been irritating, stung, even caused little bumps to form. This product has not had any negative side effects! I put a small amount on in the morning and pat it in gently so it absorbs quickly. I then put a moisturizing eye cream over the top (my eye area also gets very dry). I think that splashing cold water on my face after washing it in the morning has also helped to reduce the excess fluids that build up in our faces over night. This product is only $15.00, which is totally worth it in my opinion, and can be found at your local Sephora or online! Different products were for different people, just because it worked for me does not mean it will be effective for you. But from someone who has tried TONS of under-eye products, this one has been the best so far!